Melancholia (Greek μελαγχολία), in contemporary usage, is a mood disorder of non-specific depression, characterized by low levels of enthusiasm and low levels of eagerness for activity. In a modern context, "melancholy" applies only to the mental or emotional symptoms of depression or despondency; historically, "melancholia" could be physical as well as mental, and melancholic conditions were classified as such by their common cause rather than by their properties. Similarly, melancholia in ancient usage also encompassed mental disorders which would later be differentiated as schizophrenias or bipolar disorders. Melancholia was described as a distinct disease with particular mental and physical symptoms as early as the fifth and fourth centuries BC. Hippocrates, in his Aphorisms, characterized all "fears and despondencies, if they last a long time" as being symptomatic of melancholia. 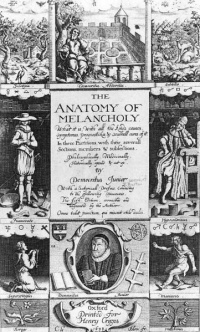 The most extended treatment of melancholia comes from Robert Burton, whose The Anatomy of Melancholy treats the subject from both a literary and a medical perspective. Burton wrote in the 16th century that music and dance were critical in treating mental illness, especially melancholia. But to leave all declamatory speeches in praise of divine music, I will confine myself to my proper subject: besides that excellent power it hath to expel many other diseases, it is a sovereign remedy against  despair and melancholy, and will drive away the devil himself. Canus, a Rhodian fiddler, in Philostratus, when Apollonius was inquisitive to know what he could do with his pipe, told him, "That he would make a melancholy man merry, and him that was merry much merrier than before, a lover more enamoured, a religious man more devout." Ismenias the Theban, Chiron the centaur, is said to have cured this and many other diseases by music alone: as now they do those, saith Bodine, that are troubled with St. Vitus's Bedlam dance. A famous allegorical engraving by Albrecht Dürer is entitled Melencolia I. This engraving portrays melancholia as the state of waiting for inspiration to strike, and not necessarily as a depressive affliction. Amongst other allegorical symbols, the picture includes a magic square, and a truncated rhombohedron . The image in turn inspired a passage in The City of Dreadful Night by James Thomson (B.V.), and, a few years later, a sonnet by Edward Dowden. During the early 17th century, a curious cultural and literary cult of melancholia arose in England. It was believed that religious uncertainties caused by the English Reformation and a greater attention being paid to issues of sin, damnation, and salvation, led to this effect. In music, the post-Elizabethan cult of melancholia is associated with John Dowland, whose motto was Semper Dowland, semper dolens. ("Always Dowland, always mourning.") The melancholy man, known to contemporaries as a "malcontent," is epitomized by Shakespeare's Prince Hamlet, the "Melancholy Dane." Another literary expression of this cultural mood comes from the death-obsessed later works of John Donne. Other major melancholic authors include Sir Thomas Browne, and Jeremy Taylor, whose Hydriotaphia, Urn Burial and Holy Living and Holy Dying, respectively, contain extensive meditations on death. A similar phenomenon, though not under the same name, occurred during Romanticism, with such works as The Sorrows of Young Werther by Goethe. 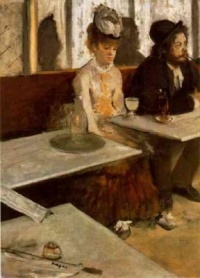 In the 20th century, much of the counterculture of modernism was fueled by comparable alienation and a sense of purposelessness called "anomie." From Late Latin melancholia, which was in turn borrowed from the Ancient Greek medical term μελαγχολία (melankholía, “blackness of the bile”). Unless indicated otherwise, the text in this article is either based on Wikipedia article "Melancholia" or another language Wikipedia page thereof used under the terms of the GNU Free Documentation License; or on original research by Jahsonic and friends. See Art and Popular Culture's copyright notice. This page was last modified 16:36, 25 November 2014.